The Enterprise Zone Program provides tax credits for new jobs and a sales tax rebate on building materials and equipment for businesses creating new jobs. 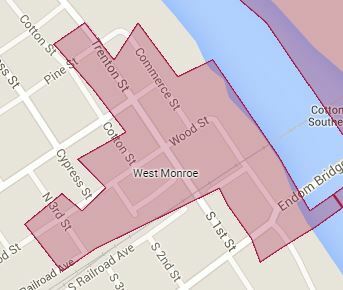 Since the Downtown West Monroe area is part of an Economic Development Zone, businesses can hire individuals and receive tax credits regardless of where the employee lives. The Restoration Tax Abatement Program delays assessment of building improvements made to structures in historic districts/downtown areas for 5-10 years (the business does not have to pay property tax on improvements for 5-10 years). Looking for something to purchase or just enjoying a day out, we know you will have a great time shopping antique stores to specialty stores. Glassware, furniture, pottery, unfinished furniture, dinnerware, old coins, records, kitchen items, jewelry, vintage clothing, sterling or just a special gift. Antique Alley is the place to shop. Items past and present, from Europe to America are available. A day shopping, exploring, hunting for that special item; Antique Alley invites you to spend time with us. Welcome to the City of West Monroe’s official website. We have made a special effort to make this site easy to use, informative and comprehensive. Whether you are a resident or a visitor to the community, it is important to us that you feel at home. Since its establishment in 1883, West Monroe has prided itself as being a safe, fiscally responsible City with a small town atmosphere and big city amenities. Throughout the community, you’ll still find neighbors visiting after Sunday services and picnicking in the park. You’ll also find Louisiana’s first nationally accredited police force, major food and retail chains, and innovative programs to preserve both our environment and culture. West Monroe-it’s the place you’ve been hoping to find. While we believe this website can answer most of your questions, in some cases there is no substitute for personal contact. Feel free to give us a call here at City Hall (318-396-2600) for any additional help you may need. Thanks for going online with us. EATat over 100 locally owned and flavored restaurants serving fried chicken, Catfish DeSiard, gumbo, crawfish, smothered pork chops, tasty po’boys, big burgers, hotwater cornbread, banana caramel pudding, and more! Historic buildings play a special role in creating the distinctive character of each and every community. Their essential legacy of cultural, educational, recreational, aesthetic, social, and environmental benefits must be preserved for present and future generations. The Louisiana Division of Historic Preservation’s professionally trained staff works in the public’s interest to preserve and restore these buildings so they can enhance and enrich our environment and, thus, our lives. The Louisiana Cultural Districts Program was created by Act 298 of the 2007 Regular Session of the legislature. The primary goal of this initiative is to spark community revitalization based on cultural activity though tax incentives.